C-SPAN has been covering the UN General Assembly debate on a resolution demanding that countries abide by Security Council resolutions on Jerusalem. The representative of Venezuela spoke on behalf of the Non-Aligned Movement, which was backed by the South African delegation and other speakers. 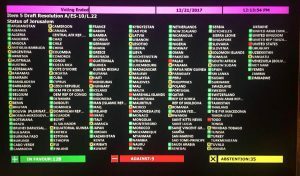 The final vote was 128-9-35, achieving the two-thirds required under the “Uniting for Peace” procedure. Paul is author of the just-released book Of Foxes and Chickens: Oligarchy and Global Power in the UN Security Council. He said today: “Coverage of the UN Security Council does not disclose what is really going on in this secretive and despotic institution. Washington causes a stir when it casts a public veto such as the one on Jerusalem, but in fact it uses its veto power daily in private sessions and it regularly dictates Council action (or inaction) in line with U.S. ‘interests.’ The Council is a mafia-like body in which a single member imposes itself on all the rest. In contrast to Britain, France, Russia and China, the U.S. is the capo dei capi — the boss of all the bosses. “The Trump administration is openly threatening to withhold U.S. foreign aid to other states if they do not follow U.S. dictates. That threat is less hollow than some think. After a key vote in the Security Council targeting Iraq in 1990, the U.S. punished Yemen (one of the world’s poorest countries) by openly cutting off all U.S. aid. “That was the most expensive vote you ever cast,’ said the U.S. ambassador to his Yemeni counterpart in the Council chamber.